"I came up with this recipe because I could not find a recipe I was looking for. A very simple, easy, and quick dish to put together. I always make this for myself when I grill steaks for my family." Place cod on a piece of aluminum foil and season with salt, black pepper, and garlic powder. 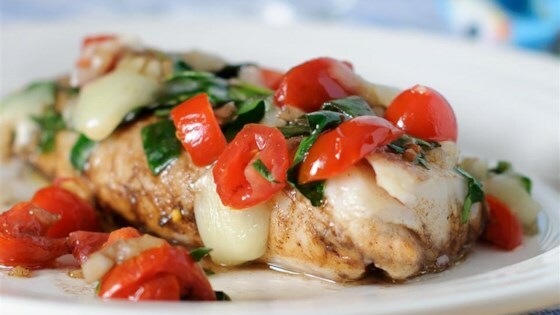 Top cod with spinach, tomato, and onion; season again with salt and black pepper. Drizzle olive oil and balsamic vinegar over cod and top with mozzarella cheese. Fold foil over cod creating a packet, crimping the edges together making a seal. Grilled bread and swordfish get dressed up with a cherry tomato vinaigrette. I, too, baked it instead of grilled. Omitted the cheese, used fresh chopped garlic and added basil. Served on top of mashed potatoes & roasted asparagus. Will definitely make this again. Made this last night and it was delicious! Just sprinkled on the balsamic and I didn't seed the tomatoes. Very healthy! Very tasty, easy and quick to make. Looks great on the plate. Also it provides a nice base to experiment a bit with some additional flavors - maybe basil, ginger, oregano. Absolutely delicious! Thank you for sharing this recipe TSASI! I had no spinach so used fresh basil leaves and it was so good!